My immigrant Freeland ancestor is David Freeland, who arrived in Canada from Scotland in 1821 with his family. As I have been working on this Surname Saturday post, I have been finding out much more about this branch of my family, which I will share in upcoming blog posts. The image at right is from page 96 of A Dictionary of Scottish Emigrants to Canada before Confederation, by Donald Whyte (Toronto: Ontario Genealogical Society. Volume 2, 1995. 435p.). If I interpret this entry correctly, David Freeland was from Lanarkshire, Scotland. He (with his wife and five children) came to Quebec, Canada, on the ship, David of London, arriving on 19 May 1821. They left from Greenock, Renfrewshire, Scotland, in association with an emigration society and they settled in Lanark Township, Lanark County, Ontario. The code of ICS refers to Immigration: Canada from Scotland with a description of "Selected records in the Ontario Department of Public Records and Archives [now the Archives of Ontario], 77 Grenville Street, Queen's Park, Toronto, M7A 2K9. Reel 154." 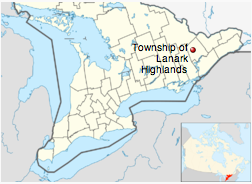 Wikipedia has a brief entry for Lanark, Ontario, (in addition to newly incorporated (1993) Lanark Highlands Township, Ontario) noting that it was founded in 1820 by Scottish immigrants who named it after Lanark, Scotland. Textiles was one of its major industries. I found the reference for this book in an index (U.S. and Canada, Passenger and Immigration Lists Index, 1500s-1900s) on Ancestry.com, and then looked at a copy of of the book at the NEHGS Library, where I scanned the above page. Ancestry.com has another index: Canadian Immigrant Records, Part Two which provides additional information about David Freeland's family: that his wife was age 28 and that the family included: "male child age 7; female children ages 8.5, 3, 9, 11." Update as of October, 2016: David and his family, had moved south to the United States during the 1820s, living in New Hartford, Oneida County, New York, by the time of the 1830 U.S. Census. In the 1850 U.S. Census, I find David Freeland, occupation Weaver, in the household of his son, James, in Allegheny, Pennsylvania. In the 1860 U.S. Census, I find David Freeland in the Buffalo, New York, household of his daughter, Mary Wolf, her husband, Frederick Wolf (a Lake Captain), and their two children, Oswald and Charlotte. I couldn't find a David Freeland in the 1840 U.S. Census that seemed to fit my David Freeland. (The 1840 census is not an every-name census, and doesn't include as much detailed information as later census records.) However, I did find an entry for "Freder. Wolf" in Buffalo, New York, which included two males of the appropriate ages to be Frederick and his father-in-law, David, and one female of the appropriate age to be Frederick's wife, Mary (Freeland) Wolf. If this is the same Frederick Wolf, it appears that David Freeland's wife died by 1840. The names of his children that I do know include James, Barbara, Mary and Anna. I descend from his son James. James Freeland was born in Scotland sometime between 1815 and 1821. He married Nancy Rainey, whom I have written about, as she is one of my long-lived female ancestors. I have also written about James previously, as he was a plumber in the 1850 and 1860 census. There are two men with the name of James Freeland who served in Union forces from Pennsylvania in the Civil War and it is possible that one of them is "my" James, but again, I need to do more research on that. He died about 1863, based on the family's listing in Pittsburgh City Directories in the 1860s. They had at least five children, born between 1850 and 1858. Mary (b. 1850), William (b. 1854), Claudine (b. 1855), Edward, Emma (twins, b. 1858). In the post about Nancy Rainey Freeland, I shared several census records and city directory images showing. I descend from their daughter Mary who I believe is the oldest. Mary Freeland was born in February 1850, in Pennsylvania, presumably Allegheny. She married James Hunter on April 13, 1871. See their portraits here. Generation 4: Percy Earle Hunter married Marguerite Lysle.